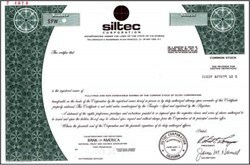 Beautifully engraved SPECIMEN certificate from the Siltec Corporation. This historic document was printed by the Security-Columbian Banknote Company in 1983 and has an ornate border around it with a vignette of the company logo. This item has the printed signatures of the Company’s President ( Robert E. Lorenzini ) and Secretary. Since coming to Salem, they have grown to be Salem Electric's largest power customer and Salem's largest industrial employer, employing approximately 1,100 people. MSA is active in Salem, not only as an employer, but as a solid corporate citizen, providing leadership, volunteers, and monetary contributions to such fine organizations as United Way, Salem Area Chamber of Commerce, Gilbert House Children's Museum, Salem Boys and Girls Club, Shangri-la, Salem-Keizer public schools, Oregon School for the Deaf, and many more.